The Item type is the base type for all visual items in Qt Quick. All visual items in Qt Quick inherit from Item. Although an Item object has no visual appearance, it defines all the attributes that are common across visual items, such as x and y position, width and height, anchoring and key handling support. See the Keys attached property for detailed documentation. Item layouts can be mirrored using the LayoutMirroring attached property. This causes anchors to be horizontally reversed, and also causes items that lay out or position their children (such as ListView or Row) to horizontally reverse the direction of their layouts. See LayoutMirroring for more details. An Item will normally be rendered directly into the window it belongs to. However, by setting layer.enabled, it is possible to delegate the item and its entire subtree into an offscreen surface. Only the offscreen surface, a texture, will be then drawn into the window. If it is desired to have a texture size different from that of the item, this is possible using layer.textureSize. To render only a section of the item into the texture, use layer.sourceRect. It is also possible to specify layer.sourceRect so it extends beyond the bounds of the item. In this case, the exterior will be padded with transparent pixels. The item will use linear interpolation for scaling if layer.smooth is set to true and will use mipmap for downsampling if layer.mipmap is set to true. Mipmapping may improve visual quality of downscaled items. For mipmapping of single Image items, prefer Image::mipmap. Setting layer.enabled to true will turn the item into a texture provider, making it possible to use the item directly as a texture, for instance in combination with the ShaderEffect type. In this example, we implement the shader effect manually. The Qt Graphical Effects module contains a suite of ready-made effects for use with Qt Quick. See ShaderEffect for more information about using effects. Note: layer.enabled is actually just a more convenient way of using ShaderEffectSource. When an item's layer is enabled, the scene graph will allocate memory in the GPU equal to width x height x 4. In memory constrained configurations, large layers should be used with care. In the QPainter / QWidget world, it is some times favorable to cache complex content in a pixmap, image or texture. In Qt Quick, because of the techniques already applied by the scene graph renderer, this will in most cases not be the case. Excessive draw calls are already reduced because of batching and a cache will in most cases end up blending more pixels than the original content. The overhead of rendering to an offscreen and the blending involved with drawing the resulting texture is therefore often more costly than simply letting the item and its children be drawn normally. Also, an item using a layer can not be batched during rendering. This means that a scene with many layered items may have performance problems. Layering can be convenient and useful for visual effects, but should in most cases be enabled for the duration of the effect and disabled afterwards. This read-only property indicates whether the item has active focus. If activeFocus is true, either this item is the one that currently receives keyboard input, or it is a FocusScope ancestor of the item that currently receives keyboard input. Usually, activeFocus is gained by setting focus on an item and its enclosing FocusScope objects. In the following example, the input and focusScope objects will have active focus, while the root rectangle object will not. See also focus and Keyboard Focus in Qt Quick. This property holds whether the item wants to be in tab focus chain. By default this is set to false. The tab focus chain traverses elements by visiting first the parent, and then its children in the order they occur in the children property. Pressing the tab key on an item in the tab focus chain will move keyboard focus to the next item in the chain. Pressing BackTab (normally Shift+Tab) will move focus to the previous item. To set up a manual tab focus chain, see KeyNavigation. Tab key events used by Keys or KeyNavigation have precedence over focus chain behavior, ignore the events in other key handlers to allow it to propagate. Anchors provide a way to position an item by specifying its relationship with other items. Margins apply to top, bottom, left, right, and fill anchors. The anchors.margins property can be used to set all of the various margins at once, to the same value. It will not override a specific margin that has been previously set; to clear an explicit margin set its value to undefined. Note that margins are anchor-specific and are not applied if an item does not use anchors. Offsets apply for horizontal center, vertical center, and baseline anchors. Text anchored to Image, horizontally centered and vertically below, with a margin. Left of Text anchored to right of Image, with a margin. The y property of both defaults to 0.
anchors.fill provides a convenient way for one item to have the same geometry as another item, and is equivalent to connecting all four directional anchors. To clear an anchor value, set it to undefined. 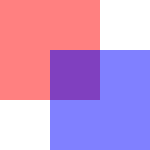 anchors.alignWhenCentered (default true) forces centered anchors to align to a whole pixel; if the item being centered has an odd width or height, the item will be positioned on a whole pixel rather than being placed on a half-pixel. This ensures the item is painted crisply. 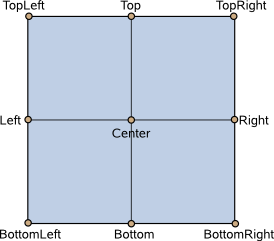 There are cases where this is not desirable, for example when rotating the item jitters may be apparent as the center is rounded. Note: You can only anchor an item to siblings or a parent. For more information see Anchor Layouts. Specifies the position of the item's baseline in local coordinates. The baseline of a Text item is the imaginary line on which the text sits. Controls containing text usually set their baseline to the baseline of their text. For non-text items, a default baseline offset of 0 is used. The children property contains the list of visual children of this item. The resources property contains non-visual resources that you want to reference by name. It is not generally necessary to refer to these properties when adding child items or resources, as the default data property will automatically assign child objects to the children and resources properties as appropriate. See the data documentation for details. This property holds the collective position and size of the item's children. This property is useful if you need to access the collective geometry of an item's children in order to correctly size the item. This property holds whether clipping is enabled. The default clip value is false. If clipping is enabled, an item will clip its own painting, as well as the painting of its children, to its bounding rectangle. The data property allows you to freely mix visual children and resources in an item. If you assign a visual item to the data list it becomes a child and if you assign any other object type, it is added as a resource. It should not generally be necessary to refer to the data property, as it is the default property for Item and thus all child items are automatically assigned to this property. This property holds whether the item receives mouse and keyboard events. By default this is true. Setting this property directly affects the enabled value of child items. When set to false, the enabled values of all child items also become false. When set to true, the enabled values of child items are returned to true, unless they have explicitly been set to false. Setting this property to false automatically causes activeFocus to be set to false, and this item will longer receive keyboard events. This property holds whether the item has focus within the enclosing FocusScope. If true, this item will gain active focus when the enclosing FocusScope gains active focus. For the purposes of this property, the scene as a whole is assumed to act like a focus scope. On a practical level, that means the following QML will give active focus to input on startup. See also activeFocus and Keyboard Focus in Qt Quick. Defines the item's position and size. The (x,y) position is relative to the parent. Defines the natural width or height of the Item if no width or height is specified. The default implicit size for most items is 0x0, however some items have an inherent implicit size which cannot be overridden, for example, Image and Text. Note: Using implicitWidth of Text or TextEdit and setting the width explicitly incurs a performance penalty as the text must be laid out twice. Holds the effect that is applied to this layer. The effect is typically a ShaderEffect component, although any Item component can be assigned. The effect should have a source texture property with a name matching layer.samplerName. Holds whether the item is layered or not. Layering is disabled by default. A layered item is rendered into an offscreen surface and cached until it is changed. Enabling layering for complex QML item hierarchies can sometimes be an optimization. None of the other layer properties have any effect when the layer is disabled. This property defines the internal OpenGL format of the texture. Modifying this property makes most sense when the layer.effect is also specified. Depending on the OpenGL implementation, this property might allow you to save some texture memory. Note: ShaderEffectSource.RGB and ShaderEffectSource.Alpha should be used with caution, as support for these formats in the underlying hardare and driver is often not present. Holds the name of the effect's source texture property. This value must match the name of the effect's source texture property so that the Item can pass the layer's offscreen surface to the effect correctly. See also layer.effect and ShaderEffect. Holds whether the layer is smoothly transformed. This property defines the rectangular area of the item that should be rendered into the texture. The source rectangle can be larger than the item itself. If the rectangle is null, which is the default, then the whole item is rendered to the texture. This property holds the requested pixel size of the layers texture. If it is empty, which is the default, the size of the item is used. This property defines the OpenGL wrap modes associated with the texture. Modifying this property makes most sense when the layer.effect is specified. This property holds the opacity of the item. Opacity is specified as a number between 0.0 (fully transparent) and 1.0 (fully opaque). The default value is 1.0. When this property is set, the specified opacity is also applied individually to child items. This may have an unintended effect in some circumstances. 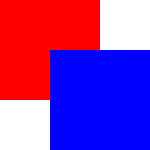 For example in the second set of rectangles below, the red rectangle has specified an opacity of 0.5, which affects the opacity of its blue child rectangle even though the child has not specified an opacity. This property holds the visual parent of the item. Note: The concept of the visual parent differs from that of the QObject parent. An item's visual parent may not necessarily be the same as its object parent. See Concepts - Visual Parent in Qt Quick for more details. This property holds the rotation of the item in degrees clockwise around its transformOrigin. The default value is 0 degrees (that is, no rotation). See also Transform and Rotation. This property holds the scale factor for this item. A scale of less than 1.0 causes the item to be rendered at a smaller size, and a scale greater than 1.0 renders the item at a larger size. A negative scale causes the item to be mirrored when rendered. Scaling is applied from the transformOrigin. See also Transform and Scale. Primarily used in image based items to decide if the item should use smooth sampling or not. Smooth sampling is performed using linear interpolation, while non-smooth is performed using nearest neighbor. In Qt Quick 2.0, this property has minimal impact on performance. This property holds the name of the current state of the item. If the item is in its default state, that is, no explicit state has been set, then this property holds an empty string. Likewise, you can return an item to its default state by setting this property to an empty string. See also Qt Quick States. This property holds the list of possible states for this item. To change the state of this item, set the state property to one of these states, or set the state property to an empty string to revert the item to its default state. See Qt Quick States and Animation and Transitions in Qt Quick for more details on using states and transitions. This property holds the list of transformations to apply. For more information see Transform. This property holds the origin point around which scale and rotation transform. Nine transform origins are available, as shown in the image below. The default transform origin is Item.Center. This example rotates an image around its bottom-right corner. To set an arbitrary transform origin point use the Scale or Rotation transform types with transform. This property holds the list of transitions for this item. These define the transitions to be applied to the item whenever it changes its state. This property holds whether the item is visible. By default this is true. Setting this property directly affects the visible value of child items. When set to false, the visible values of all child items also become false. When set to true, the visible values of child items are returned to true, unless they have explicitly been set to false. Note: This property's value is only affected by changes to this property or the parent's visible property. It does not change, for example, if this item moves off-screen, or if the opacity changes to 0. See also opacity and enabled. This read-only property lists all of the item's children that are currently visible. Note that a child's visibility may have changed explicitly, or because the visibility of this (it's parent) item or another grandparent changed. Sets the stacking order of sibling items. By default the stacking order is 0. Items with a higher stacking value are drawn on top of siblings with a lower stacking order. Items with the same stacking value are drawn bottom up in the order they appear. Items with a negative stacking value are drawn under their parent's content. The following example shows the various effects of stacking order. Returns the first visible child item found at point (x, y) within the coordinate system of this item. Returns null if there is no such item. Returns true if this item contains point, which is in local coordinates; returns false otherwise. Forces active focus on the item with the given reason. This method sets focus on the item and ensures that all ancestor FocusScope objects in the object hierarchy are also given focus. See also activeFocus and Qt::FocusReason. Forces active focus on the item. The reason for the focus change will be Qt::OtherFocusReason. Use the overloaded method to specify the focus reason to enable better handling of the focus change. Grabs the item into an in-memory image. Use targetSize to specify the size of the target image. By default, the result will have the same size as the item. If the grab could not be initiated, the function returns false. The following snippet shows how to grab an item and store the results to a file. The following snippet shows how to grab an item and use the results in another image element. Note: This function will render the item to an offscreen surface and copy that surface from the GPU's memory into the CPU's memory, which can be quite costly. For "live" preview, use layers or ShaderEffectSource. Maps the point (x, y) or rect (x, y, width, height), which is in item's coordinate system, to this item's coordinate system, and returns a point or \rect matching the mapped coordinate. If item is a null value, this maps the point or rect from the coordinate system of the root QML view. Maps the point (x, y) or rect (x, y, width, height), which is in this item's coordinate system, to item's coordinate system, and returns a point or rect matching the mapped coordinate. If item is a null value, this maps the point or rect to the coordinate system of the root QML view. Returns the item in the focus chain which is next to this item. If forward is true, or not supplied, it is the next item in the forwards direction. If forward is false, it is the next item in the backwards direction.